Now that my son has left home and is settling into adulthood, I found myself ready to pay all my attention to my 14 year old daughter and to compensate for being obsessed with her brother, (well, someone had to get him through his IB exams,) I have now turned my attention to her. Not only have I discovered homework not done, and it is only the first week, but I have also decided to project manage her after school activities. I reckon by ensuring I keep her exceptionally busy, I will successfully avoid the ‘boy-problem’ and if I can’t avoid it, I think she might need to get to a nunnery! But in my endeavour to be a good parent, I allowed her to invite all the girls from her school home for a belated birthday party. Afterall, I now have a bigger apartment and I can be a superwoman! The plan was simple to invite the girls (hope they all don’t turn up) and allow some to sleep over. Then there was the request of, ‘can this boy come, its only one boy…etc..’ She landed up being able to invite two boys, you can imagine the boys! I consider myself, an experienced party organiser, having had plenty of sleepovers and birthday parties. My son, traditionally had all his male friends from his school sleep over in tents in the UK. It worked, it was simple it was easy…and the boys were scared of me! Imagine this new scene: 20 girls + one boy arrive on my doorstep. The noise they created was like being right next to the speakers at a rock concert. I began to panic, I am sure everyone in the building could hear. I sent an emergency SOS out to a friend, who kindly did a quick translation: Sorry for the noise, its my daughter’s 14th birthday party. I post the note by the letter boxes and then return to a sight of girls and one boy jumping up and down and singing at the top of their voices to songs I no longer recognise! Thankfully, my son’s girlfriend and her friend were assisting, and once the singing and dancing was over, we witnessed these girls and one boy begin to eat their way through pizza, cake and popcorn. I realised, I had not bought enough food. What happened to the days when girls never ate even when they were hungry? These girls were ravenous and were like locusts. Emergency supplies were required. I sent my son’s girlfriend and friend out to bring in extra supplies which were devoured as they arrived. Then there was a moment of reprive whilst they watched a DVD. Phew, time for a quick glass of wine. The girls then decided it was time for present opening and cake. Now about the cake, I had baked two, and one have failed miserably. It did not stop them from eating it. However, I have realised that my daughter is a far better baker than I am, last week she baked me a mojito cake for my housewarming party, it was sublime. I have decided that in future she can bake her own birthday cakes. A cake was baked and candles purchased and these girls and one boy sang yet again at the top of their voice. I wondered where they got their energy and was grateful that I have silence in my classroom, well, some of the time! At that moment, some girls said goodbye, the one boy said goodbye and I was left with 9 girls who were staying longer or sleeping over. They settled into singing and jumping again until a neighbour complained or rather wanted to come up and join the party. He mistook these girls for young university students and wanted to bring up a bottle of wine. This evening was becoming surreal! But what was the most fascinating event, was that these girls raided my wardrobe and my daughter’s wardrobe and played dressing up. The conversation that ensued was a discussion about their breasts, the size , the shape and whether they were happy with the size or whether they wanted bigger ones. I can assure you I was not involved in the conversation but they were discussing it so loudly it was difficult not to eaves drop. I did find this highly amusing and informative, because who really know what 14 year olds discuss? At 14, this conversation and the catwalk dressing up is an ‘Ah bless’ moment until they walked through my room parading as top models in my high heel shoes. 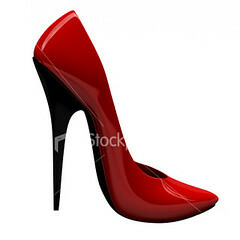 I know I have a massive high heel shoe collection but not all of them wear a size 36 (UK3) shoe and they were squeezing their feet into my shoes! My shoe collection was slowly getting ruined by these girls! It was at that point that I wasn’t sure whether to laugh or cry. However, I guess it is a small sacrifice to make a young girl happy!